Drinking water purification systems that transform tap water into 100% steam distilled water. Their water distillers combine distillation with carbon filtration for guaranteed consistent purity. 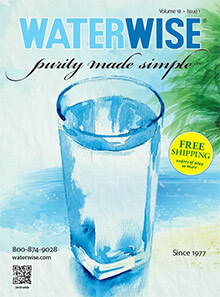 Home drinking water distillers - Purity made simple! Eliminate your water quality concerns with Waterwise steam distillers for home, office or travel. Choose from 5 to 16 gallon per day capacities. You will enjoy drinking and cooking with fresh, homemade, pure water. Be water wise, drink the purest! Shower filtration system - Enjoy chlorine free showers! Your body can absorb more chlorine in a 10-minute shower than from drinking 8 glasses of the same water. Get relief from itchy skin and scalp, burning eyes, and dull dry hair. Showerwise reduces chlorine by 95%; reduces iron, lead, mercury, hydrogen sulfide, and prohibits bacterial, fungal and mildew growth. Includes Massage Showerhead; easily adjusts for full body spray or massage. Home air purifiers - Get relief from debilitating indoor air pollution! Advanced purification technology goes beyond mechanical filtration methods to oxidize odors, settle dust, reduce allergens, and destroy viruses, bacteria, and mold. Silent - no noisy fans, no messy filters to clean or replace. Breath better with Airwise air purifiers. Whether you're looking for a drinking water purifier, shower filter or a true filterless air purifier, Waterwise has the products you want to protect your family's health at home and away.